Although at first Johnny didn't intend to race cars at all, somehow he got involved in racing. He was a jazz musician with his own jazz band and seemed happy with that. He spoke both French and English, which made him an easy target for the British racing drivers for their meetings with the ACF, for none of them was able to speak both languages. Although he wasn't top of the bill, he was a fairly good racing driver who won several important races. In F1, however, he never made it into the points. Find out how. Octave John Claes was born on August 11th, 1916 in Fulham. Because of the First World War, his parents had fled Belgium and left for Great Britain. Both his parents were obviously wealthy: his father was a rich Belgian and his mother was from a rich Scottish family. Johnny had a good feeling for music and decided to learn to play the saxophone. Later on, he became a jazz musician and even had his own band: Johnny Claes and the Clay Pigeons. In 1954, his health became a serious problem, which prompted him to quit racing. Claes got seriously ill in 1955 and died of tuberculosis on February 3rd, 1956, at the age of 39. Johnny became attracted to motor racing in 1947, and since he spoke both French and English he became an interpreter for the British drivers at the 1947 ACF GP. When he decided to actually race himself in 1948, his wealthy father duly bought him a French Talbot. He would enter 12 races in 1949 and finished two of them on the podium: the Paris GP at Montlhéry and the GP des Frontières at Chimay. The latter event would become his absolute favourite. When the World Championship got underway in 1950, Claes was part of it too. Challenging the Alfa Romeos was not an easy task in his Ecurie Belge Talbot-Lago T26C, if not impossible, and he didn't score any points in the races that counted towards the Championship. His best finish was a seventh place at Monaco. At Spa-Francorchamps the 14-car entry comprised of 7 Talbot-Lagos. Unfortunately, the Talbots weren't all that reliable and just three managed to finish (Claes took eighth). The other four drivers overcooked their engines – a not too uncommon problem for the Talbot cars. He drove for HWM in Formula 2 in a couple of events, winning the GP des Frontières in the process. Johnny in his Talbot during the 1950 British GP. In 1951, Claes got his hands on an improved Talbot-Lago, but still the car couldn't match the pace of the Italian cars, Alfa Romeo now challenged by Ferrari. Once again Johnny's best result was a seventh place, this time at his home GP at Spa-Francorchamps. There were better results in the non-championship races he entered, as Claes managed to finish fourth in the Richmond Trophy at Goodwood and fifth in the Albi GP. And again, he won the F2 GP des Frontières, this time in a Simca-Gordini T11. There was drama at San Remo, however, when Johnny crashed his Talbot into the crowd after his brake pipe broke. Sadly, several spectators were killed. In 1952, his Talbot-Lago now instantly obsolete because of the World Championship switch to F2 regulations, Johnny left for Gordini, and that seemed to pay off. He took third in two non-championship races at Marseille and Sables d'Olonne, but there was no luck in his first Championship GP of the year. Maybe his mood wasn't helped by being overtaken in the last few laps at his home GP, but he decided to move back to his own Ecurie Belge. He drove two GPs for the Ecurie before switching to HWM for the German GP. His fifth and last Championship entry in 1952 was for the team of Vickomtesse de Walckiers. 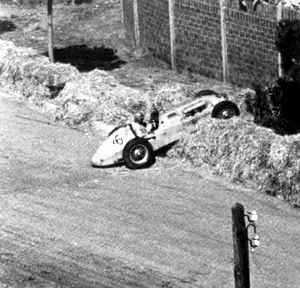 But that proved to be a disaster as he failed to qualify at Monza. 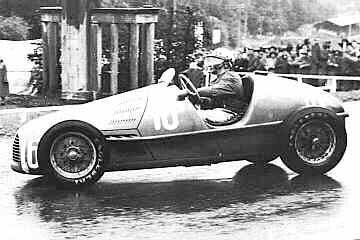 He used his Talbot one more time in 1952, in the shared F1/F2 GP del Valentino in Turin, in which he took sixth place. 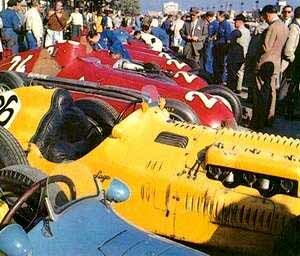 Johnny's yellow T26C-DA in the pits at Pedralbes in 1951, the Alfettas in their final race lining up behind it. In 1953 things changed again, as his Ecurie Belge switched to a Connaught A-type. He drove the car in four Championship events, along with minor F2 events and several shared F1/F2 races, his best results being sixth places at Bordeaux, Albi and AVUS. For his home race he got the chance to drive for the works Maserati team – it was probably his best and only opportunity for a significant Championship result. 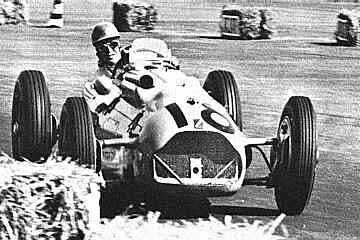 He was in a good eighth position when he had to hand over his car to Juan Manuel Fangio, who had dropped out of the race. Fangio managed to reach third and a potential podium, thus sharing his points with Claes, when the car stopped two laps before the finish. Eventually he would finish only one World Championship GP out of five starts in 1953. He did win the monster rally Liege-Rome-Liege, being the fastest across Europe after a stunning drive of 52 hours – single-handedly, as his co-driver was taken ill before the start. In 1954, his health became a serious problem and he decided not to race at all, except in the Le Mans 24 hours, winning the 1.5-litre class and finishing 12th overall. Very early in the season, on January 3, he made a trip to sunny South America to compete in the Rio GP at Gavéa, sharing a Ferrari 166MM with Jacques Herzet on their way to sixth place. The end of his race in the 1951 Spanish GP. In 1955, Johnny would rejoin the circus and started his home GP in Stirling Moss's Maserati 250F. It could have been his best race, but again it wasn't to be for the poor Belgian, who was actually still very ill. He ran into engine trouble in practice and became a non-starter. He would start in just one more major GP, at Zandvoort in an ENB-entered Ferrari, only to finish in a poor eleventh place. He also started in the infamous 1955 edition of the Le Mans 24 Hours, partnering Jacques Swaters in an Ecurie Belge Jaguar. The pair finished third overall. 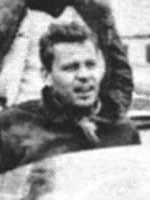 It was the race that marked the end of an era: Mercedes withdrew their remaining cars after Pierre Levegh got killed when his Mercedes was launched into the crowd, killing 82 spectators. His final effort came in the Liege-Rome-Liege rally. Together with co-driver Lucien Bianchi he managed to claim third. Although a fine driver, luck was never on his side in Grand Prix racing. If he drove well, his car was too slow. And when the car was good enough, he dropped out for one reason or another. From his 23 World Championship starts he finished 13, with his best result – a seventh place – coming in the 1950 Monaco GP as well as the 1951 Belgian GP. On just two occasions a driver error was responsible for his retirement, leaving him with eight mechanical failures. He showed well in various non-championship races, however, allowing him to show his abilities as a good driver.